The primary mission of the Fault and Rupture Mechanics focus group is to develop physics-based models of the nucleation, propagation, and arrest of dynamic earthquake rupture. We specifically solicit proposals that will contribute to the six fundamental problems in earthquake physics defined in the SCEC4 proposal and enhance understanding of fault system behavior through interdisciplinary investigation of the special fault study areas. We encourage researchers to address this mission through field, laboratory, and modeling efforts directed at characterizing and understanding the influence of material properties, geometric irregularities and heterogeneities in stress and strength over multiple length and time scales, and that will contribute to our understanding of earthquakes in the Southern California fault system. Investigate the importance of different dynamic weakening and fault healing mechanisms, and the slip and time scales over which these mechanisms operate (3a, 3b, 3c, 3e). Determine the properties of fault cores and damage zones (1a, 1b, 3a, 3b, 4a, 4b) and characterize their variability with depth and along strike (1a, 1b, 4a, 4b) to constrain theoretical and laboratory studies, including width and particle composition of actively shearing zones, signatures of temperature variations, extent, origin and significance of on- and off-fault damage, healing, and poromechanical behavior. Determine the relative contribution of on- and off-fault damage to the total earthquake energy budget (3c, 4a, 4b), and the absolute levels of local and average stress (3e). Collaboration with the Community Stress Model (CSM) TAG is encouraged. Develop, test, and apply innovative source-inversion strategies to image the space-time rupture evolution of earthquakes reliably, propose source-inversion methods with minimal assumptions, and provide robust uncertainty quantification of inferred source parameters; propose and develop new source-inversion benchmarks, and generate synthetic data of various types (seismic, static, far-field, near-field) in cooperation with other SCEC groups; collaboration with the Source Inversion Validation (SIV) TAG is encouraged. Develop realistic descriptions of heterogeneity in fault geometry, rock properties, stresses and strains, and tractable ways to incorporate heterogeneity in numerical models of single dynamic rupture events and multiple earthquake cycles (3e, 3f, 4b, 4d, 6b). 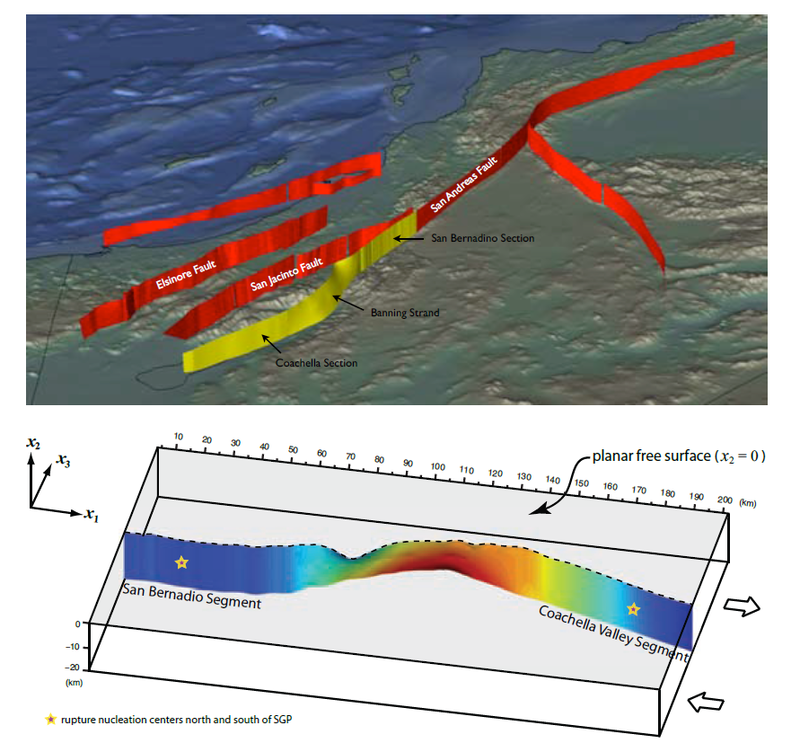 Test dynamic rupture modeling that incorporates these heterogeneities first by verifying the computational algorithms with benchmark exercises of the Dynamic Rupture Code Verification TAG, then by comparing the results with geological and geophysical observations. Understand the significance of fault zone characteristics and processes for fault dynamics (3a, 3b, 3c) and formulate constitutive laws for use in dynamic rupture models (3d). Evaluate the relative importance of fault structure and branching, material properties, interseismic healing, fluid processes and prior seismic and aseismic slip to earthquake dynamics, in particular, to rupture initiation, propagation, and arrest, and the resulting ground motions (3c, 3d, 3f). Characterize earthquake rupture, fault loading, degree of localization, role of fluids and constitutive behavior at the base of and below the seismogenic zone (1a, 1b, 1e, 4a). Preparatory efforts, including creep law compilations and a database and modeling framework design workshop, to finalize the design criteria for the future Community Rheology Model (CRM), integrating these FARM priorities with the community modelling efforts. Develop observations of slow slip events and non-volcanic tremors in southern California and understand their implications for constitutive properties of faults and overall seismic behavior (3a, 5a-5e). Assess the predictability of rupture direction and directivity of seismic radiation by collecting and analyzing field and laboratory data (4a, 4b), and conducting theoretical investigations to understand implications for strong ground motion. Develop physics-based models that can describe spatio-temporal patterns of seismicity and earthquake triggering (2e, 4e). Explore similarities between earthquakes and offshore landslide sources with the goal of better understanding their mechanics and the tsunami hazard from sources in southern California. Figure 1. Bruhat et al. (2015) examined an ensemble of over 1000 dynamic rupture simulations on fractally rough faults with strong rate-weakening friction to identify conditions for supershear rupture speed. In contrast to prior thinking that supershear was favored on smooth, straight fault segments, supershear propagation was found to be most common on the roughest faults. Probability density function of rupture velocity from ensemble dynamic rupture simulations on non-planar, rough faults. (top) On a smooth fault, rupture velocities remain sub-Rayleigh, even for pule-like ruptures at high background stresses. (bottom) On a rougher fault, supershear ruptures appear, particularly at high background stress. Figure 2. Shi and Day developed dynamic rupture simulations to investigate the role of initial stresses and fault geometry on the likelihood of a San Andreas rupture through the San Gorgonio Pass. The study integrates fault geometry from SCEC CFM-v4 (top) and initial stress constraints from the SCEC CSM (bottom). The results highlight the critical sensitivity of dynamic rupture to initial stress assumptions in geometrically complex faults. Figure 3. Jiang and Lapusta studied the effect of the depth limit of dynamic weakening on microseismicity patterns over several cycles. They compared fault models with down-dip limit of dynamic weakening being shallower (top row, Model A) and deeper (bottom row, Model B) than the transition between velocity-weakening (VW) and velocity-strengthening (VS). (Left) Schematic illustrations of the two models. Regions with the VW and VS low-rate properties are shown in white and yellow, respectively. Regions with enhanced dynamic weakening are shown as red hashed rectangles. Nucleation-promoting spots with altered friction properties are shown as open grey circles. (Right) The resulting microseismicity is illustrated as circles using the circular crack model with 3 MPa stress drop. Colors indicate typical final slip in a large event. The intensity and locations of microseismicity differ in the two models due to different stress distribution with depth and its evolution with time. Figure 4. Kirkpatrick and Shervais mapped the internal structure of the Boyd fault, Southern California, using the structure-from motion methodology, to establish the dimension of contact asperities and how the fault roughness evolves with displacement. Example of the field workflow: a.) Photograph of an exposure of the Boyd fault. Around 150 photos similar to this were used to construct the outcrop model. b.) Model generated with Agisoft’s PhotoscanPro shown from the same perspective as a. Boxes in a and b show the extent of c. c.) Rectified image exported from PhotoscanPro after the model was rotated to view the exposure down the slip vector. Lines show traces mapped in the field that were used to calculate roughness. White lines are the edges of the principal slip zone and green lines define the extent of the fault core. The Fault and Rupture Mechanics (FARM) interdisciplinary group focuses on understanding earthquake rupture mechanics through a combination of theoretical modeling, laboratory experiments and field observations. The results from research in FARM are closely linked to efforts in the SDOT, UCERF, and CSM programs (among others) in SCEC4. Improvements in computational capabilities are making it possible to more properly model dynamic rupture propagation on geometrically realistic fault structures. Similarly, technical advances in experimental and analytical equipment are opening up new opportunities for investigating the earthquake deformation processes during quasi-static and dynamic conditions in both laboratory and natural fault samples. Progress in this area remains diverse and projects are numerous; however, several themes remain at the forefront as we look forward to SCEC5. Considerable effort has remained focused on how heterogeneous fault stress and fault structure (e.g., roughness, larger scale fault segmentation and geology) influence seismicity and rupture propagation. Several studies have explored the role of fault roughness on earthquake processes. 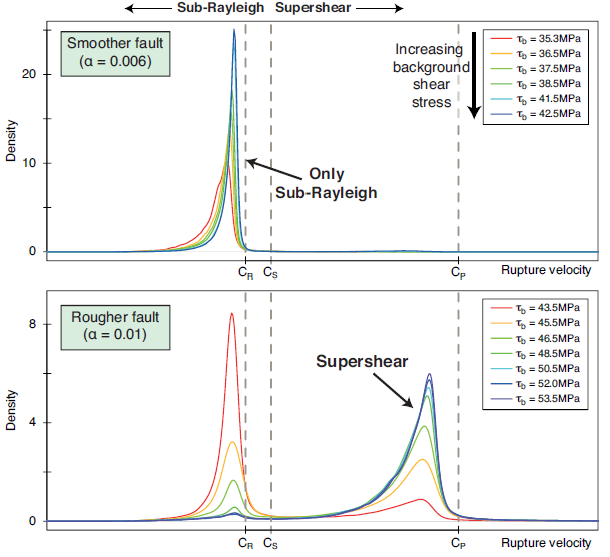 For example, new suites of calculations provide further insight into how fault roughness on non-planar faults actually promotes supershear rupture (Figure 1; Bruhat et al., 2015), an effect opposite of conventional wisdom. The role of local variations in fault orientation (i.e. fault roughness) has also been exploited to constrain the width of surface creep zones of the Southern San Andreas fault (Fialko et al. ); application of coulomb plasticity (accounting for variations in normal stress arising from fault strike) provides a good explanation for the variations in the creeping width determined from geodetic studies. Further, Fialko et al. note that distributed interseismic creep needs to be accounted for to prevent systematic bias in paleoseismic slip rate estimates, especially where coseismic slip is distributed near the surface (owing to low normal stress and/or stable frictional properties). 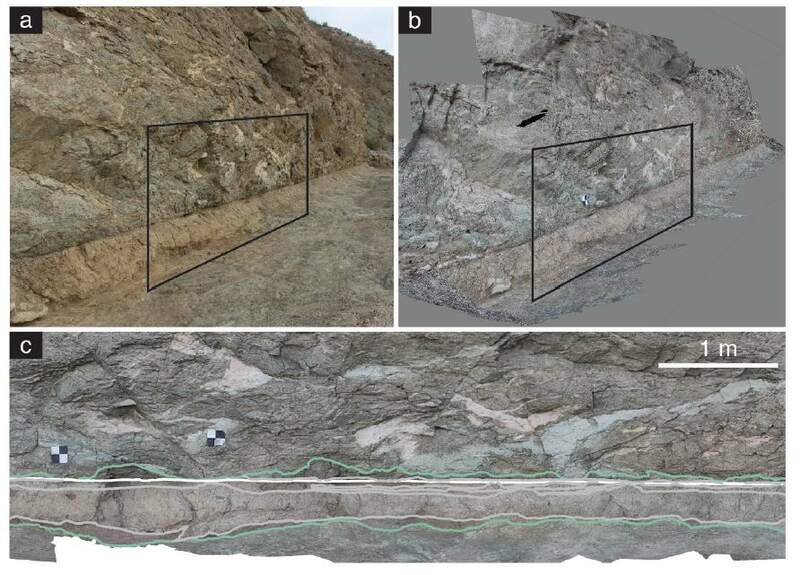 These studies highlight the need for improved geologic constraints on processes that promote strain localization within evolving faults - a focus of structural studies of exhumed faults (Figure 2; Shervais and Kirkpatrick). The level of background stress, stress heterogeneity, and heterogeneity of fault zone properties influence both rupture propagation and the distribution of aftershocks. Shi and Day investigate the role of fault geometry and initial stress on the likelihood of through-going ruptures across the San Gorgonio Pass Section of the San Andreas fault (Figure 3). They developed dynamic rupture simulations integrating information from SCEC CFM and CSM and found that the three different stress models available in the SCEC CSM lead to different answers regarding ruptures across the SGP, highlighting the need for reliable and self-consistent stress inputs in fault systems with complex geometry. The role of fault heterogeneity has also been explored in earthquake cycle models that include realistic frictional properties (Jiang and Lapusta). Models with different large-scale fault properties and the same heterogeneity produce microseismicity with different b-values in the G-R relation, reflecting variations in stress gradient and fault coupling. Such studies illustrate how observations of microseismicity can be used to constrain the frictional properties of faults, which can in turn be included into integrative earthquake cycle and rupture models and relationships between seismicity and geodetic data. Understanding rupture processes at the base of the seismogenic zone remains critical for evaluating the potential for large events in Southern California. New modeling studies on this topic focus on how realistic depth-dependent fault properties affect the spatio-temporal complexity of earthquake slip and the variability of arresting depth (Figure 4; Jiang and Lapusta). With reasonable depth-dependent parameters, thermal pressurization (TP) allows large earthquakes to penetrate deeper into creeping fault extensions, even when the shear zone width increases with depth below the seismogenic layer. An issue that remains potentially problematic is that incorporation of TP and flash heating (FH) into such models generally leads to rapid and near-total (and perhaps unrealistic) coseismic stress drops. Future work will be directed towards identifying fault properties that allow for reasonable stress drops for large events. Ma and colleagues hypothesize that dynamic compaction of fault gouge may provide a solution to this issue. They show that large dynamic stresses during rupture propagation cause the gouge layer to compact ahead of the rupture front, leading to rapidly elevated pore pressure in the effectively undrained fault zone - and significant dynamic weakening of the principal fault surface. Compared to other dynamic weakening mechanisms such as flash heating and thermal pressurization, this mechanism does not require slip to initiate. After the passing of the rupture front, dilatancy of undrained fault gouge reduces the pore pressure and restrengthens the fault, promoting a more pulse-like rupture. Thus dynamic gouge compaction and dilatancy provides a simple mechanical explanation for weak mature faults and pulse-like earthquake ruptures on these faults. Analysis of dynamic weakening mechanisms also remains a focus of experimental and geological studies. New laboratory experiments have been performed to characterize the processes responsible for flash weakening in gouge (Griffiths and Prakash; studying dynamic weakening in samples from the SAFOD drill hole) and thermal pressurization (Tullis; who developed protocols to constrain competing effects of thermal and hydraulic diffusivity by controlling the permeability of the experimental samples). Theoretical studies provide new insights into the physical processes responsible for dynamic weakening, and rationale for their inclusion into earthquake cycle and rupture models. The role of thermally-activated contact processes have now been included into STZ models of gouge deformation (Carlson and colleagues); these PIs have also combined the STZ theory with fracture mechanics to model grain fragmentation. These analyses show that grain splitting dominates at small shear strains and grain abrasion dominates at larger displacements. A feedback between strain localization and grain fragmentation provides an explanation for the formation of a thin gouge layer with a characteristic particle size several orders of magnitude smaller than those outside the shear band. Further observations on the role of dynamic weakening on natural faults are being compiled using novel new techniques to date and constrain peak temperatures during past earthquakes on exposed faults in Mecca Hills (Evans). The observation (or lack thereof) of tectonic tremor provides a potentially powerful constraint on the mechanical properties of faults deep in the lower crust. Ampuero et al. developed a novel phase coherence method to identify localized sources of tremor-like activity (continuous radiation over extended durations) and systematically applied it to seismic waveforms to search for precursory tremor in the 5 minutes preceding 10,000 earthquakes in Southern California. They found no evidence for fore-tremor activity, but several un-catalogued foreshocks in events outside the SCSN footprint. Similarly, Peng et al. continued a systematic search for tectonic tremors in California. They found no additional triggered tremor beneath the San Gabriel Mountain in Southern California, suggesting that near-lithostatic fluid pressure is necessary, but not sufficient, for tremor to occur. They found no clear evidence of repeated LFE activity on the San Jacinto fault (SJF) triggered by the 2002 Denali Fault earthquake, or during other times where ambient tremors were suggested. Thus, the tremor along the SJF is rare and the source depth is not well constrained. Ghosh improved resolution of Parkfield tremor with data from a small-aperture array installed near Cholame; the improved resolution reveals that migrating swarms are the general mode of tremor occurrence in this area. Ghosh et al. also show delayed acceleration of tremor activity (lasting a few days) after the 2014 M6 South Napa earthquake. This observation can provide constraints on models of dynamic triggering of tremor and slow slip. Segall and colleagues modeled dynamic rupture triggering by slow slip events, focusing on how the spatial dependence of effective normal stress and slip weakening distance (dc) influence this behavior. They analyze how far a stable creeping zone can penetrate into a velocity weakening region before going unstable; for the aging law this distance is close to the size of the longest fault that never generates dynamic slip, but for the slip law it can be considerably greater. New experimental programs on viscous creep behavior at conditions appropriate for the base of the seismogenic zone also provide new insights into the possible mechanisms responsible for strain localization and slow earthquake instability (Sammis et al.). Bruhat, L., E.M. Dunham, and Z. Fang (2015), Conditions governing super-shear transition on nonplanar faults, Annual Meeting, Seismological Society of America, Pasadena, CA (and in preparation for J. Geophys. Res). Bradley, A.M. (2014), Software for efficient static dislocation-traction calculations in fault simulators. Seis. Res. Lett., 85(6).